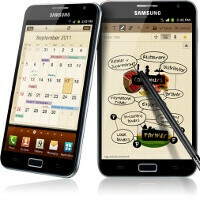 The Samsung Galaxy Note is a 5.3-inch beast of a device standing right between a smartphone and a tablet. It’s definitely appealing to some and plain too huge to be a phone for others, but it hardly leaves people indifferent. Is it successful or not? Opinions will vary and only sales will tell the true story. Samsung officialized the first numbers about the Galaxy Note and it seems to be received pretty well with over 1 million shipped handsets so far. Now, this doesn’t actually mean that 1 million Notes were sold - this is only a number of handsets shipped to carriers and vendors, so the actualy sales number is smaller. This warm welcome would be further tested in 2012 when Samsung has promised to make the Galaxy Note available stateside. Could this be your next phone? The international version works with T-mo 2g, AT&T 3g,and 4g. The US version when released will be for AT&T and work on AT&T 2g,3g,4g, and LTE. if you live in the US, just buy a note, if not then wait for the GSIII..
Smh.... if there is a sgs3? It won't be release any time soon? Maybe next next year... Js. I'm getting this phone. ONLY if it has LTE capabilities . If the note comes to the U.S will it come to verizon? Cause I heard its coming but only to AT&T for now. I guess it could come to verizon but with the release of the Nexus the Note won't come anytime soon in my opinion! When I first got it I showed it to all my friends at a Christmas party and everyone's jaw dropped. At first, most laughed at how obsurdly large it was, but once they got it in their hands and played around with it, they were left captivated and thoroughly impressed. It's not for everyone-obviously-but it works very well for those who embrace it, regardless of its quirkiness. I love the GNote! what service do you have? and is it pretty fast? has anyone looked in the mirror when answering this phone ?